Students in Tood Biddle’s agriculture classes at Bald Eagle Area High School are preparing for the Pennsylvania Farm Show held in early January in Harrisburg. Biddle said this will be the fourth year the district has been represented, and will include showing tractors, landscape boxes and rabbits. The new thing this year, however, is the number of rabbits being shown – a record of 32 total. There are 23 students in Biddle’s animal science class who nearly all wanted to be a part of the rabbit exhibit, Biddle added. For sophomore Caleb Cain, he has spent much of the school year preparing to show a meat pen, which are three Californian rabbits, and will also display one Dutch rabbit for show. Judges look for specific natural markings, good depth, a smooth fur coat, and more. 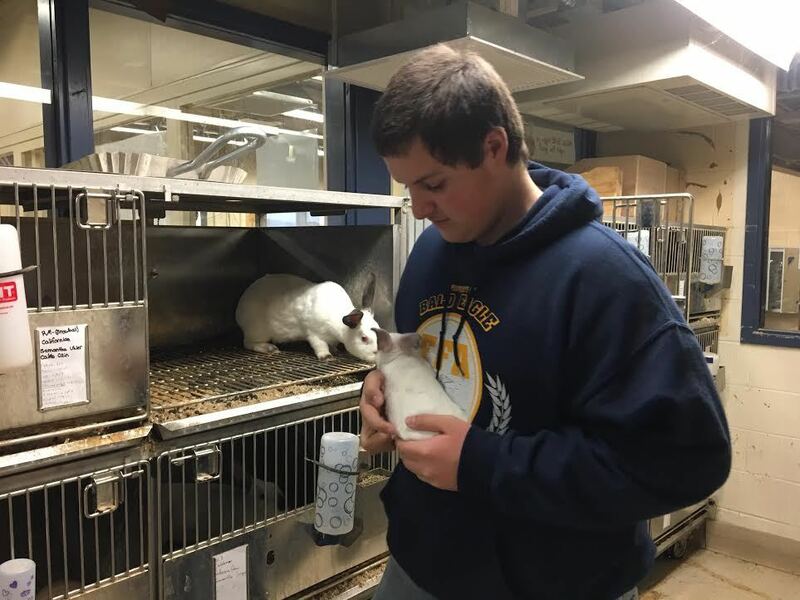 To be eligible for Farm Show, Biddle requires his student to make sure the rabbits are born in the classroom so students learn about the process of raising rabbits from conception to full growth. And Farm Show preparation is all tied into class curriculum. PA Farm Show is from Jan. 6-13, but BEA students will be there on the on Jan. 4 for pre-Farm Show exhibits.